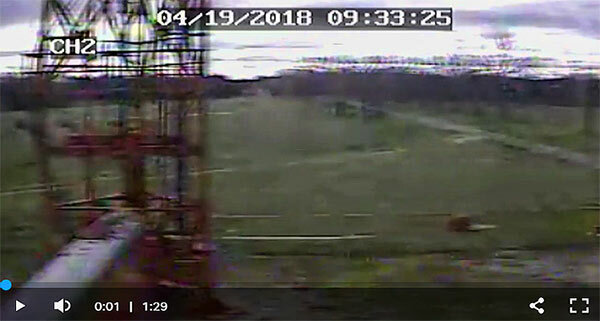 Missouri State University (MSU) has released surveillance videos of the horrific 1,891-foot-tall guyed tower collapse that occurred in Fordland, Mo. on April 19, 2018 that killed a 56-year-old owner of a Washington state tall tower erection company. OSHA’s report, stating that both the managing consultant and the tower contractor were both at fault for the collapse, is available here. The videos were first requested on May 10, 2018 by OSHA Safety Compliance Officer Chet Ray as part of OSHA’s investigation. Following OSHA’s report, MSU, which owns the KOZK TV tower, released the surveillance videos to Wireless Estimator. According to the OSHA investigation, four men were on the tower at the 105-foot level when it became obvious to all that the structure was under stress after a loud cracking noise was heard and the tower became unstable. The foreman and owner of the erection company, Steve Lemay, had his men quickly descend while he investigated what the problem was. As the third man reached ground, as can be seen in the video above, he started running to safety and had less than two seconds before the structure hit the ground in a spiraling storm of steel. This video obtained by Wireless Estimator shows crew members in the upper right hand screen becoming aware of the serious structural condition of the tower and then running once it begins to collapse, as an erector running away from the collapsing tower stumbles near some hog rods. When the structure was completely down, two men can be seen searching the wreckage in the hopes of saving the company’s owner who perished in the collapse. A tech is captured by a surveillance camera in a carport running from the falling 1,891-foot guyed tower, and then immediately rushing back to the collapse site to see if he can provide any assistance. A shop employee heard the horrific crash that shook his office and ran to identify what had happened.